Tipper Jon seems to have a bad case of Cadillac fever. In between internet searches he writes us: imagine the security of floating down the highway at triple digit speeds, secure in the knowledge that very few other vehicles could present a threat to your safety, ensconced as you are in a 1967 Eldorado, seated behind yards of Detroit steel. In fact, it is arguable that you might not notice a collision with anything smaller than a Taurus. If this is your idea of motoring (and you have family in the gasoline & oil business), check out this handsomely preserved example of the some of 1967's finest American iron. But I strongly suggest you measure your garage before you buy. 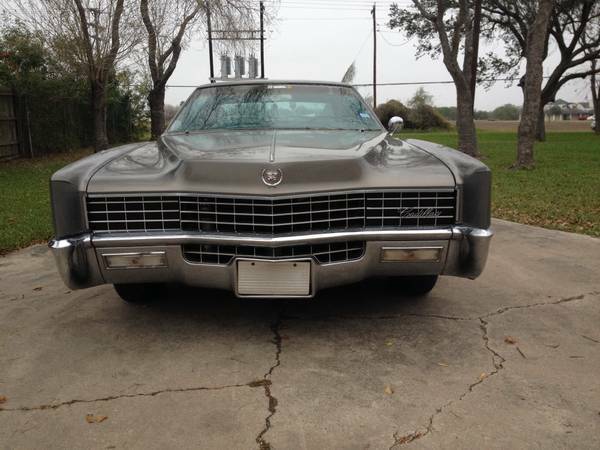 Find this 1967 Cadillac Eldorado for sale in Harlingen, TX for $10,000 via craigslist. The outside of the car looks absolutely gorgeous. You are then scrolling through the pictures and whamo the curve ball hits you. 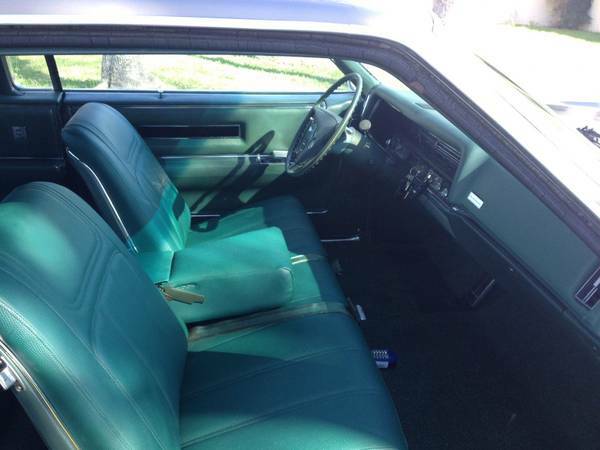 Who the hell spec'd out the funky green interior? It is certainly different, but can't help thinking a red or black would be more appealing today. 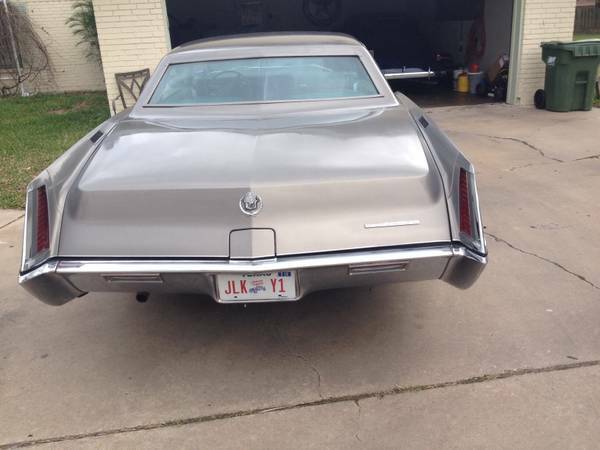 This has to be one of the coolest rear ends on any American land yacht. The single exhaust pipe is a crime. A car of this magnitude demands dual exhaust. 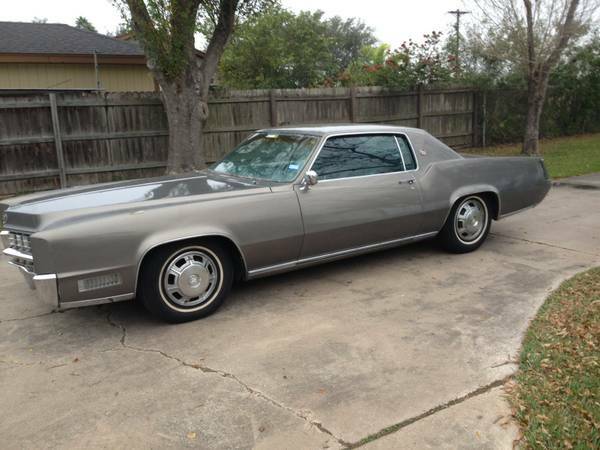 These are incredible road machines...120" wheelbase, only 4" shorter than an original Buick Electra 225 (225" long). The floor in the front is flat enough that you can run the electric front seat as far back as it will go and curl up on the floor for a nap! This was the "Sporty" Cadillac. Sporty meaning it had only two doors and hide-away headlights. As a 'kid' working in gas stations in the early '70s (when we still checked oil for customers), the early Eldo and Toro hoods were the monsters of all time. One never truly appreciates how big those things are until you try to raise one up to full extension! Hit the interstate with a big cigar, a glass of your best adult beverage (no one cared in the '60s) and set the cruise for "floored" and you owned the road baby! All that, and they go through the snow like nobody's bidness. Just dropped in to make the obligatory Pablo Picasso comment "girls would turn the color of an avocado when he would drive down the street in his El Dorado" . but that swimming pool interior seems more David Hockney. Wow, you are a well rounded man of culture! In the under the hood shot , WTF is this thing? Looks like the hydraulic pump for a convertible top or something. Knowing the crazy engineering on Cadillac it almost makes sense but not quite. Can we get an ad hoc what the hell is that thing in the picture anyway quiz going here? I'm guessing it's the tank for the rear air shocks. I'm guessing its a vacuum canister/reservoir for pneumatically operated headlight doors? LOVE this! The lines are still so fine. Wonder if a color change would explain the odd combo of exterior and interior colors. The dour, metallic grey seems pretty modern for a 51 year old Caddy. I Found a site down under that has the '67 Caddy interior and exterior colors. It looks like this car is either Regal Silver Metallic or Crystal Firemist Metallic. I know not all of you guys are bike nerds however my friend has a Titanium and celeste bike that reminds me a lot of this Caddys color combo. I love it. Wouldn't change a thing with this car. I knew a guy who got his scout stuck in the middle of nowhere in the Idaho wilderness. driftbooze cruising stoners in a mid seventies model Eldo pulled him out of the drift. He was pretty embarrassed, I'm shocked he even told me.